There’s sustained advantage to be gained from combating climate change, but many businesses just aren’t seizing it. Many of the world’s largest companies recognize the potential value of investing in sustainable technologies and approaches to combat climate change. Disruptive circular business models, which foster the reuse or reduced use of products and materials, can generate additional revenue and help fuel the development of new markets. Yet, less than a third of companies are seizing the strategic opportunity and dedicating the funds needed to adopt low-carbon solutions underpinned by these models and innovative new technologies. 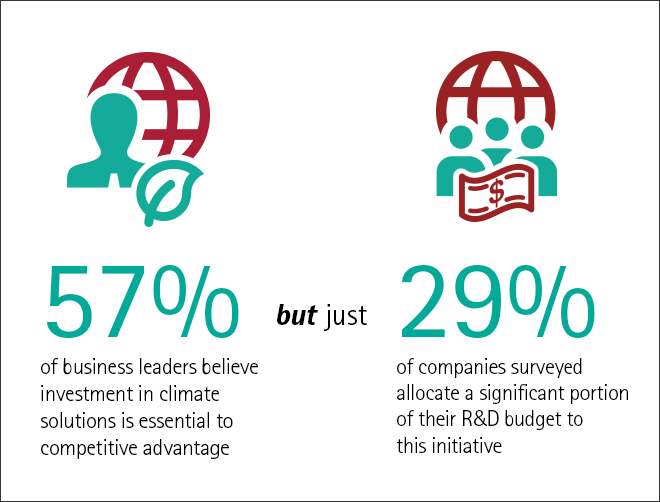 Learn more about how the world’s CEOs are driving competitiveness through climate solutions. As a showcase for the most innovative thinking on high-performance business, Outlook focuses on six core themes: Redefining Competitiveness, Digital Disruption, Global Operating Model, Open Innovation, Sustainability and Workforce of the Future. We feature original content devoted to these topics as well as a selection of unique insights offered by professionals throughout Accenture.